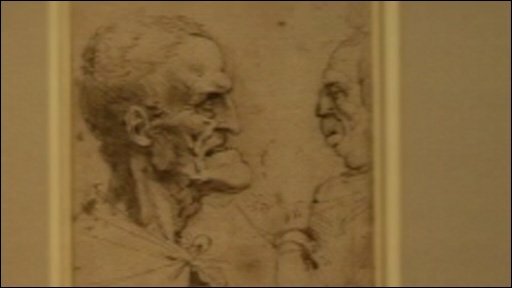 Drawings by Leonardo da Vinci on show at the National Library of Wales were previously stored there during World War II, researchers have found. It was thought the 10 works had never been to the library in Aberystwyth before. But officials discovered the drawings had been placed there for safety in a specially built secret cave of masterpieces. They are now on show as part of Prince Charles's 60th birthday celebrations. Among the other masterpieces stored in the library's secret cave were the Saxon Chronicles, the works of Wycliffe and Chaucer and a large collection of charters including the Magna Carta. There was also a wealth of autographs and letters from the kings and queens of England, Sir Walter Raleigh, Sir Francis Drake, Francis Bacon, Oliver Cromwell, the Trafalgar Memorandum of Nelson and Robert Scott's Antarctic journals. Other treasures included autographs and holographs of William Shakespeare, and paintings by JMW Turner and Michelangelo. A spokeswoman for the national library said: "The story of the evacuation begins in 1933 when the Right Honourable W.A.Ormsby-Gore (later Lord Harlech) in his role as commissioner of works in Stanley Baldwin's government, called together the directors of all major cultural institutions, museums, libraries and art galleries, to consider a scheme for the safe storage of their most valuable collections in the event of a war in Europe." 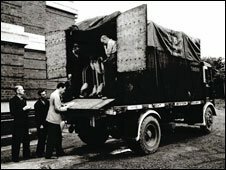 Within hours of the declaration of war 70 years ago in September 1939, collections from many of Britain's cultural institutions were crated up and sent by train to Aberystwyth, she added. Twenty-five containers arrived from the British Museum alone, and some institutions even sent their cultural experts to Aberystwyth with the collections. To ensure the safety of such precious artefacts, the national library took the decision to carve out an underground cave to house some of the evacuated material. But by May 1946, all the material had been returned by rail to their collective institutions and the library cave's has remained empty ever since. 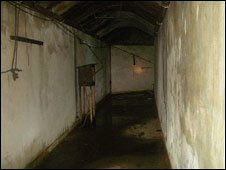 Inside the National Library of Wales' "secret cave"
Delwyn Tibbot, whose father Gildas Tibbot was deputy librarian during the war years, said: "Every night my father, a policeman and a member of the British museum staff, would go down to the tunnel to ensure that everything was as it should be." 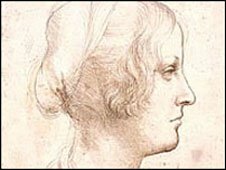 The da Vinci drawings, which belong to the Royal Collection, are part of a touring exhibition which is visiting towns and cities across the UK.